Governor Reynolds, David Young and fellow Republicans on campaign train. 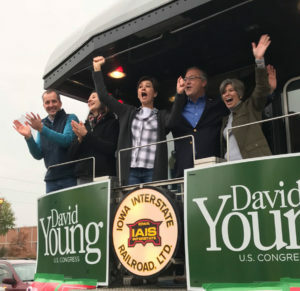 On the final weekend before the election, Iowa candidates and their supporters made final pitches to voters in all sorts of places, from front door steps to the back of a train. 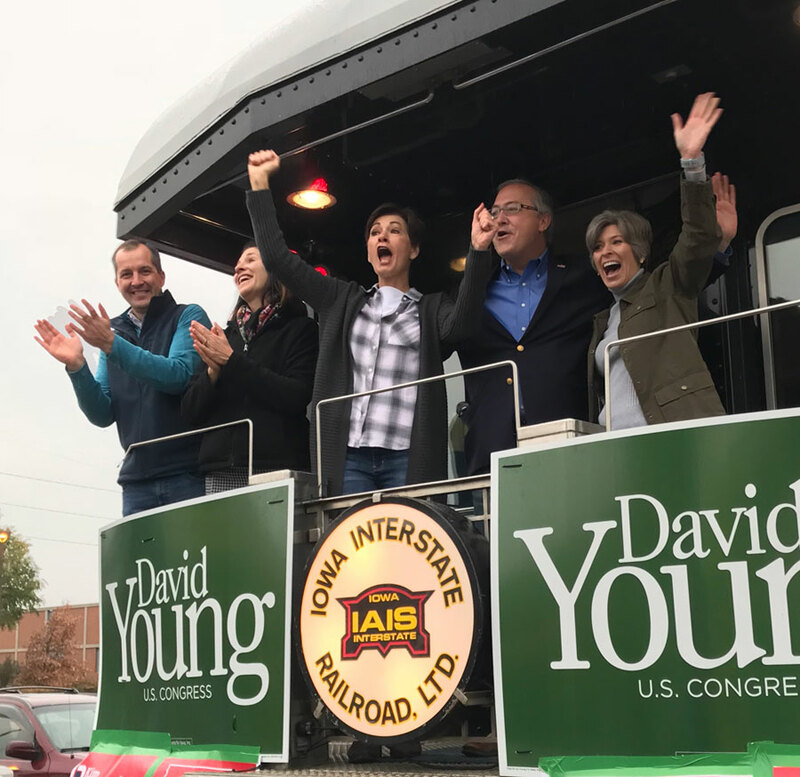 Early Saturday morning in Des Moines, Governor Kim Reynolds, Congressman David Young and other members of the Republican team climbed aboard a train, bound for a few stops in western Iowa. Reynolds emphasized that the economy is working due to the “partnership” between Republicans in Des Moines and Republicans in Washington, D.C.
“We can’t stop. We can’t slow down. We need all of you to help us finish strong and take this victory across the finish line,” Reynolds said. Congressman David Young, a Republican seeking a third term, emphasized the same theme. “Iowa is on the right track. America’s on the right track, so it makes sense that we should be a track to victory, right?” Young asked. About three hours later, Cindy Axne, the Democrat who’s challenging Young, spoke with volunteers trained to go door-to-door to talk to voters. “Pick up that packet. Come back. Get another one. Even if it starts to downpour and rain, you’d rather be wet today than crying on Wednesday,” Axne said, to cheers and laughter. Axne told the group her race against Young is considered too-close-to-call. “This is one of the most important races in the country because this literally is the opportunity for us to take back the majority and make sure that Democratic values, those hard-fought Iowan values, are represented out in congress,” Axne said. Young gave a similar charge to his supporters. 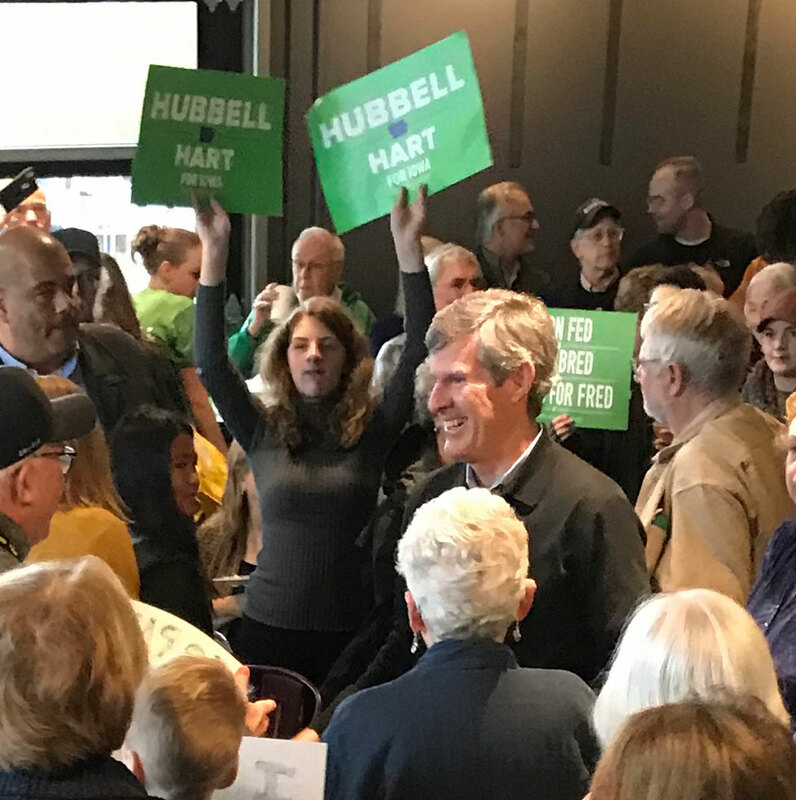 Fred Hubbell, the Democratic candidate for governor, is holding rallies around the state, too. Hubbell spoke to a few hundred Democrats in an Iowa City brew pub early Sunday afternoon. “I just have a question to get started: Are we ready to get out and vote for change?” Hubbell asked and the crowd cheered. Hubbell ended his speech by giving his supporters a to-do list. The latest data from the secretary of state’s office shows there are more than 2.17 million registered voters in Iowa. More than half a million Iowans asked for an absentee ballot. As of Friday, about 447,000 of those absentee ballots had been returned. The Des Moines Register “Iowa Poll” released Saturday night shows Iowa’s governor’s race is tight, with Fred Hubbell leading Kim Reynolds 46 to 44 percent. Jake Porter, the Libertarian Party candidate for governor, received the support of two percent of those surveyed. Two percent said they were still undecided.